Breeda CC, Myriam Doumi, Rudi Fischerlehner, Ronald Gonko, Anita Groschen, Cédric Houplin, Mareike Hube, Herman Herman, Boris Joens, Phoebee Killdeer, Jens Lowitzsch, Yuko Matsuyama, Misha Ognianer, Natalia Palshina, Lukas Pfeiffer, Theda Weber-Lucks. 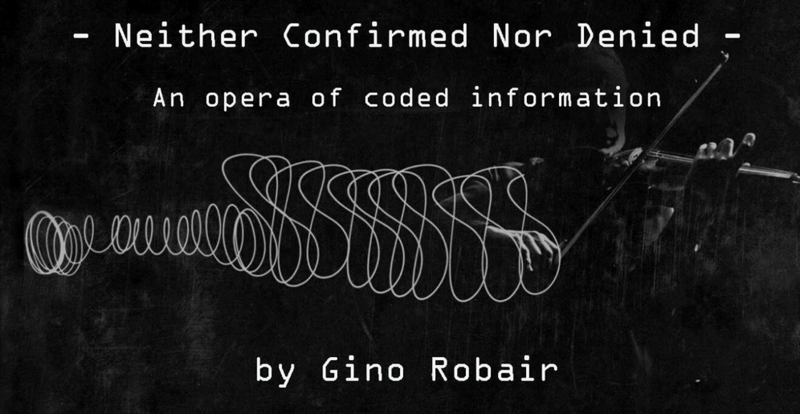 Neither Confirmed Nor Denied (NCND) is a one-act opera inspired by the mysterious "number stations" heard on shortwave radio frequencies throughout the world since the late '40s. Typically, these stations broadcast a voice (human or synthesized) reading strings of numbers, and sometimes words from the International Phonetic Alphabet (e.g., Alpha, Bravo, Charlie, etc.). Often, the coded information is surrounded by an identifier—repeated phrases in the form of electronic tones or a looped section from a folk tune or classical work. Because of this, many stations have been given colorful names based on their identifiers—The Lincolnshire Poacher, Swedish Rhapsody, Bulgarian Betty, and Papa November, to name just a few. It is widely believed that the stations may be providing coded messages between an intelligence service and its agents in the field. Judging by the variety of languages used in these broadcasts, it is presumed that government agencies across the globe use them. Some people speculate that many stations, if not all of them, are a decoy, distraction, or noise in the sense that there is no meaning; the stations are being used to exhaust the resources of their enemies. NCND is inspired by the individual characteristics of such stations. But rather than make an exact replica of the stations, I analyzed them in terms of their formal structure. This was reduced to a set of basic components that could be used to code other kinds of information; in this case, the libretto for the opera. For this event, the performers will be situated throughout the church, each with a unique score that is analogous to a number station. As these sets of instructions are carried out (aurally as well as visually) over the length of the performance, the coded story unfolds. As with all one-time transmissions, the pages of the score will be collected and destroyed after the performance.